On the processing side is miniDSP's innovative software & firmware allowing a Plug & Play real time control of the onboard DSP over Ethernet/Wifi networks. Using our Zero Conf technology, multiple modules are automatically discovered and controlled from a single User interface in real time. The onboard Digital Signal Processors (DSP) provide real time all the processing a speaker designers will expect to excel at his crossover design task. These include FIR and IIR filters (biquad input), Parametric Equalizers (PEQ), level, crossovers, comp/limiter, delay and more. The Graphical User Interface (GUI) platform is supported on both Mac and Windows environment. On the power amplifier side, the ICEpower® modules are complete AC plug-to-speaker amplification audio solutions offering flexible two-channel or bridgeable speaker drive. Their compact size, audiophile audio quality and high power output make them perfect for high-performing audio products. The amplifier is rated for up to 2x125W @ 4Ω or 1 x 450W @ 4Ω. 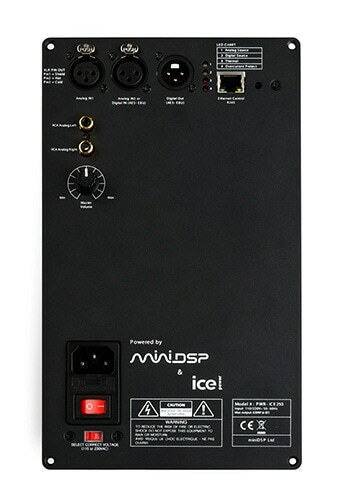 As for audio connectivity, the PWR-ICE125 is fitted with both analog balanced (XLR) & unbalanced inputs (RCA) to provide maximum compatibility. A digital input (AES-EBU) saves on the A-D conversion for maximum performance while a Digital output (AES-EBU) allows multiple plate amplifiers to be linked to each other. FIR + IIR filter options / Please consult manual for details. Access to UserDownloads section for free PWR-ICE IIR/FIR plugin. Got this amp to try out for a new amp design. Paired it with a 12 woofer and used the bridge mode. The software is great, easy to use and simple to learn even for a first time user. Great adaptability in the settings to accommodate most anything I would think. The customer that bought the sub-woofer is very happy and I was very happy with the build quality. It seems to have enough power to push the driver too which was only 85db efficient. I didn't have to change any jumpers to increase gain either. Very nice amp, I will use again on more designs I come up with for sure. Great little plate amp, could have been even better with easier ways to seal it up rather than having to have it in an external cabinet extension. Have used is several test projects. Many flexible inputs too. Very handy also having variable gain on the unit.